I’ve been doing some Windows forms programming lately – not really my thing, but needs must. I’ve got an application which needs to dynamically create a form at run time, and so I’m using a System.Windows.Forms.TableLayoutPanel. All the controls contained by the TableLayoutPanel resize automatically, and the TableLayoutPanel automatically provides scrollbars. “Great!”, I thought, “This will deal with large forms nicely.” Wrong! Notice that I’ve got a vertical scrollbar, but it hasn’t resized the child components. This, they overlap some of the fields – and I now have a nice horizontal scrollbar. Arse. I eventually found that others had had this problem and told Microsoft about it. However, they’ve decided not to fix it. Thanks Microsoft, that cost me an hour and half – it’d be wise to fix it. 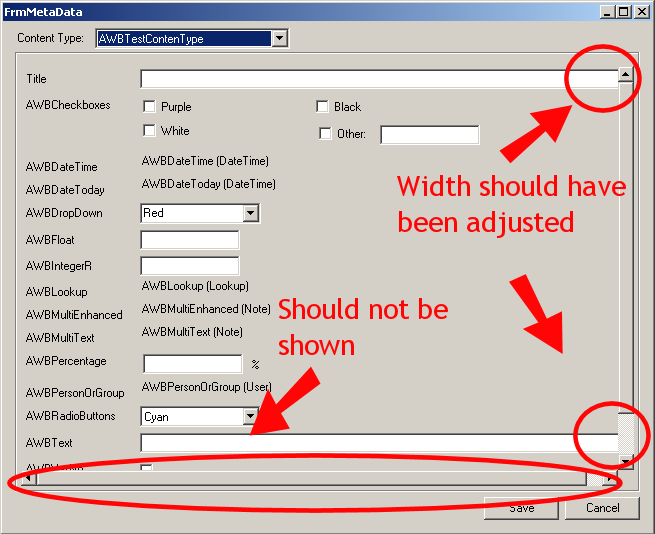 I found the answer from the same link – add a vertical scrollbar’s width as padding on the right of the TableLayoutPanel. I’m new to visual basic and have the same problem you’re describing. What do you mean by adding a vertical scrollbar’s width padding? I’m not sure how to do that. I can get the verticalscrollbar from my element but i can’t set the width. Padding is applied to the inside of the TableLayoutPanel, and it forces the contents away from its border (or edge if you prefer). You can set different paddings for the top, bottom, left and right. By setting a right padding equal to the width of a vertical scrollbar, you’re making space for the scrollbar (should it appear – or you could force it to always be there) so that it doesn’t cover any of your controls. Does the Autosizemode just need to be set to ‘GrowandShrink’? Thanks very much, padding fixed my problem. Was thinking I was going mad there for a second. F**K!! I wasted half of a f**king day because of this!!! I tried everything I could only come up with. Disabling scrollabrs, making them invisible, resizing the controls inside the table to make the whole thing narrower… everything! And the only thing you need to do is increase the table’s right padding! D; Stupid Microsoft! Thanks for sharing your findings. Finally I’ve got it fixed. Unfortunately, the controls are narrower than they could be because of the padding, but at least I don’t see the goddamn horizontal scrollbar anymore!